I have big things to report, ya'll. Firstly, I am officially on the staff of the incredible Pop Nation, as an artist interviewer, so there will be lots (and I mean, lots) of interesting artist interview reads both on Pop Nation and re-printed here on Melismatic. I've already sort of conducted one with an independent artist that should making its premiere soon, and on Wednesday, I will conduct a phone interview with a major label artist (if you follow my Twitter, you'll already know who it is...but hint -- I've written about her once before), so that interview should be making it's debut probably by this weekend at the very latest both at Pop Nation and here at Melismatic. Be sure to show your love. On more personal news, I have booked tickets to see the incomparable Paramore at the classy Hammerstein Ballroom here in NYC (is it classy? I've never been). I've wanted to see those crazy kids live since I first heard "Misery Business" on the radio back in the summer of '07 (and one of my peers/friends from my internship has already seen them a whopping 14 times...I really need to get on the stick, I guess). Since then, I've become a big fan of Hayley and the boys, devouring their Riot! album (there were so many potential singles on that album, it's almost sinful), and eventually also getting into their debut, All We Know Is Falling. Despite my love-hate with "Twilight", their soundtrack single "Decode" is also one for the ages in my opinion. 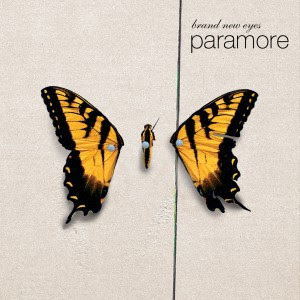 The concert is on October 21st, so it will be almost a full month after their third album, brand new eyes, is due for release. The first single, "Ignorance", is available now on iTunes and if you're a fan of Paramore, you won't dissapointed, as it follows their emo/pop/punk formula in a very good way. It may not be as catchy as "Crush Crush Crush" (or as I affectionately refer to it: "Crush 3X"...I'm so clever), but it's still very good, none-the-less.